Item Number: 266-700 19596 Actual Weight: 0.5 lb. 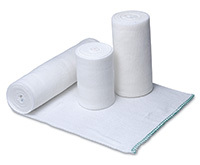 Non-sterile, latex-free bandages have excellent elasticity and recoverability. Made of a cotton and polyester knit blend. High compression bandages feature a hook and loop closure, eliminating the need for clips or tape.